"Nothing Is All Wrong. 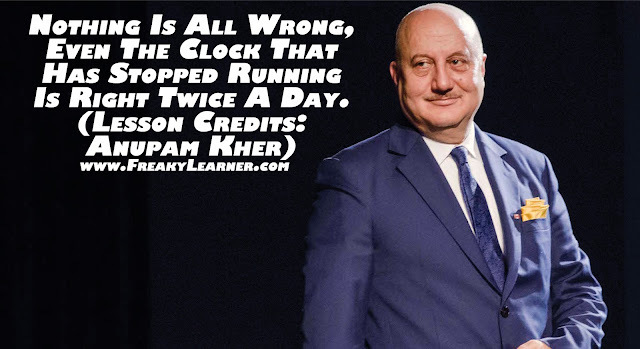 Even The Clock That Has Stopped Running Is Right Twice A Day"
I heard this quotation first time in 'The Anupam Kher Show' and I felt that it completely makes sense and started living my life on that basis. Last month on November 13, I again heard him using this statement on one of the News Channel when he was being interviewed regarding this opinion on Demonetization. I felt charged again that from now onwards I will take my decisions by myself without considering how the people would react to my decision. In contrast, Today, when I was going through the lessons I learned in past, I came across this picture and felt like post it on LinkedIn to share it with others. For the same, I searched on Google for this quotation to begin with and write something about him that how motivating it always has been for me. It brought little disappointment in my heart that even a person like The Anupam Kher does not give credit to a person from whom he must have learned this thought. May be, that is the reason that Teachers does not get that much recognition which they actually deserve because their students stop giving them the credits for what they learned from them. P.S. My intention with this post is not to discourage anybody about anybody/anything but I just want everyone to recognize the people from whom you learn things and share right source of your learning with others so that the persons from whom you learn, also feel good and be more willing to share their wisdom with others.